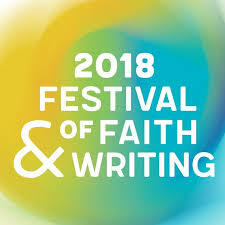 We’re two days into the Festival of Faith and Writing, one day still to go. There’s plenty to be anxious and sorrowful about these days, a theme I’m hearing often among these good people at the festival—readers and writers who tend to feel things deeply. These are folks acutely sensitive to abuses of language toward deceit and violence. But they also know that language can console and encourage, make us brave and make us laugh, clarify and challenge. We’re cherishing that power together during these three intense days. Already I’ve gathered more treasures than I can sort or ponder. So I will simply toss a few of the more portable ones into a basket today and invite you to enjoy a sampling. Take one to savor. Parker Palmer, quoting Wendell Berry: “What we need is here,” within us and between us. This is just a tiny sampling, and I’m only one person. I’m scribbling in my notebook as fast as I can, and I’m not even telling you all the clever jokes and tender stories and dear human connections I am witnessing in this extraordinary space. It will take months, maybe years to spin out and consider the implications of everything that happens this weekend. I’ll just say: Right now we need courage and beauty and tenderness and wisdom and brilliance and perseverance, and what we need is here.